Five years ago, Jeff Talamantez was living in Las Vegas and became a taxi driver. For Jeff, it seemed like a good way to earn money; after all, Vegas was the city of bright lights -- a 24-hour playground full of visitors and vacationers who didn’t know their way around. Sounds like an easy job right? Luckily, Jeff’s brother, Joe Talamantez, was able to help solve that problem. So Joe built a platform that could piece together areas and locales where people were likely to be looking for a ride. As he would soon find out, the platform would completely transform the way his brother worked. And though it’s called Cab Dash, don’t let the title fool you; Jeff says that the service has as many applications for rideshare drivers as it does for cabbies. Indeed it can -- in fact, Cab Dash has, on average, helped drivers find 30 percent more fares than they would have found on their own; that equates to about $16,000 a year or three more rides per day. Joe credits Cab Dash’s model for driver success. 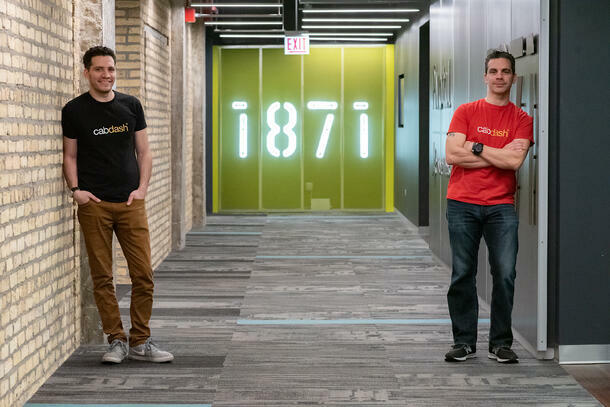 To build out Cab Dash, the brothers came to 1871 and its Latinx Incubator, run in partnership with the Illinois Hispanic Chamber of Commerce (IHCC). As graduates of the fourth Latinx cohort, Jeff says the brothers are taking their business to new heights and have their sights set on even greater objectives. Though Cab Dash has certainly grown and evolved since Jeff’s days as a cab driver in Las Vegas, it hasn’t always been easy. And though there’s plenty to be said about why you should believe in your ideas, Joe says that one of the most important assets every entrepreneur should have is a strong roster of mentors. 1871 provides work space, education, resources, and curated connections to help Chicago's entrepreneurs build and scale their business. For those who are also interested in participating in the Latinx Cohort, applications for Cohort 5 are now live. You can apply for Cohort 5 here.